Exchanging data and managing a whole range of different interfaces is a major challenge when it comes to interdisciplinary cooperation. This concerns not only the planning and execution phases of a building but also commissioning and management. Within the context of the increasingly sought-after BIM (Building Information Modeling) planning method, the architect plays a leading role in the coordination of the interdisciplinary BIM model and the related data management. After all, it’s the architect’s building model which forms the basis for the subsequent planning processes. 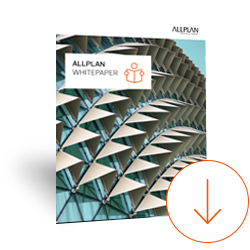 This white paper deals with the problems and solutions that arise out of this task, and gives valuable practical tips for successfully using BIM models. The construction industry is having to deal with increasingly complex building projects. The reasons for this include, on the one hand, growing demands of clients with respect to design, quality, costs and speed of implementation. And on the other hand, energy efficiency and sustainable building play an ever-increasing role. Growing internationalization and technical innovations also contribute to this development. This complexity has led to a high degree of specialization by all parties involved in the constructive works and in connection with that, to an increase in process complexity. It is important to address these challenges so that buildings can also be successfully planned, built, commissioned and operated in the future. The architect as the "central data collector"
To get the whitepaper "Practical advice for successful management of BIM data" just fill out the form. You'll get the PDF directly on the thank you page and via e-mail.